The image above shows the signage in our front window. 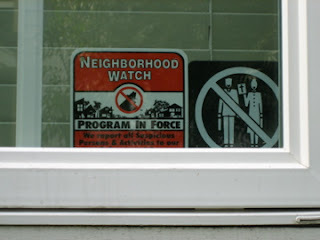 I figure that the "neighborhood watch" one is pretty common and therefore self-explanatory. The second "no preaching" one is a little less common, but when I put it in the window I still expected that people would figure it out. What do you think? Is it clear? Our little housing development is a favorite with missionaries, I assume because one can annoy a large number of people with relatively little physical exertion. We get a lot of Jehovah's Witnesses. Even though they mostly only speak Spanish, I'd have thought our sign would warn 'em off. Nope. Then, a few weeks ago we got a new breed altogether. This visit was from two young men, one obviously the tutor training the "new guy." While I was cooking dinner, I saw the tutor look at the sign in my window, and then peer through my window at my child playing on the floor. It was late afternoon and still light out, so I didn't have the blinds closed. Within moments, the student missionary rang the bell, his dementor apparently keeping a safe distance out on the sidewalk. The dude starts in on his spiel about how he's with the church of something or other. I stop him in the middle by saying, "This home does not accept religious solicitations." "Yes..." he says. "We have a sign in the window to that effect. Good evening." And I closed the door. I don't know much about the missionary mindset, but I wonder what would compel anyone other than a cretin or a criminal to intrude someplace where they are not welcome. If I have asked them to stay away, why waste their breath on those who will clearly be "ungrateful" for their efforts? Spend your time going after the clearly gullible, I say! And if your deity values my personal space so little that you are compelled to get all up in it, what would I gain by joining your little dogma circle? This problem of inconsiderate missionaries isn't likely to go away any time soon. As long as there are people out there convinced that they have the only path to the Truth, there's going to be some creep knocking on my door. My own personal code of conduct really doesn't let me be rude to strangers. I especially can't be obnoxious to someone who honestly appears to be trying to do a "good" thing. The trouble is, by disregarding that sign in my window I think that a missionary cedes credibility regarding benign intent and should be taken to task for it. What do you do when missionaries come to your door? Happily, I've not had anyone at my door trying to save my mortal soul in years. One of my ex's better qualities was his ability to bait unsolicited guests -- whether it was someone selling a vacuum cleaner or a church member with our salvation on their mind, he'd invite them in, pour them a glass of iced tea (the essence of Southern hospitality!) and proceed to talk their ear off, asking bizarre questions, and basically wasting enormous amounts of their time (the neighbours should have been grateful). He had been raised in the South, so was well-acquainted enough with the Bible to ask all sorts of circular logic-type questions about scriptures and eternal damnation. I usually had to retreat to a bedroom before he opened the door, because I could never fight off the giggles that always ensued. We simply wait, smiling, until they ask their first question. Missionaries are easy enough to spot before they open their mouths and predictable enough to use a question as a way to invite you into conversation. We wait for the Smiling Pause of Empty Politeness and do basically what you did: "we're not interested, thank you" followed by a prompt but polite closing of the door. No waiting, just close the door. If the person chooses to talk to an obviously closing door it's on their time, not mine. We once had a fellow make his way into our house under the guise of taking a survey. We lived in University housing at the time and got plenty of genuine survey takers. Once in our home and comfortably sitting in our armchair, the guy meandered his way amiably to the topic of religion. And out came the pamphlets and some off handed comment about how we know we're going to hell without Jesus, right? Peter evenly but sternly took it to him for openly lying his way into our house. If you mean to prosthlyletize, then come out and tell us what your intentions in our home are. If you hide this from us by lying about some fake survey, this means you predict that we will react badly to your true intentions and lay down some sort of falsehood to get your foot in our door. This is lying, which is a sin according to our understanding of basically all Christian denominations. Peter got on an erudite roll, as he is prone to do, so I stood sternly and accusingly until Peter paused. I then moved to the door and opened it, standing with my hand on the knob in invitation for the creep to leave. I couldn't open my mouth for fear that I'd laugh in his face, but didn't want to leave. He was looking pretty shamed when he left, as he ought to have. I give credit to the guy for openly accpeting that he had been caught out doing something deceptive. Catching them out in sin is always a way to stop anything other than Ums, I Only Meants and Buts from coming out of their mouths. Nobody ever comes to proselytize me anymore. It's not that I like being proselytized, it's just that missionaries are so fun to mess with. For example, I'm always talking to people who get invitations to come to church. I don't want to go, but maybe it would be nice to have the opportunity to turn someone down once in a while. "No thanks, I'm an atheist!" I'd say. Or maybe I'd just look at them sincerely and ask them to tell me all about this god person, where he lives, what he does for a living. I forgot to mention, but I still remember fondly a halloween costume my friend Jeffy had one year. He had very shiny black polyester outfit with a preacher's collar, large sparkly futuristic sun glasses and a cape. He was a space priest, riding in on the tail of a comet. You didn't mess with the space priest--he came wielding a proselytaser. I love it! We'll have to be more creative than grumpy here, I can tell. You have all given me ideas, mwahahahahaha!